Hundreds protested at the Capitol on Tuesday, one of several demonstrations across the country against the oil pipeline being built by Dallas-based Energy Transfer Partners. Hundreds rallied at the Texas Capitol Tuesday protesting the controversial Dakota Access pipeline project — a show of support for the Native American tribe that has been fighting the $3.7 billion midwest venture being built by Dallas-based Energy Transfer Partners. The protest was one of many that took place across the country on Tuesday as opposition to the 1,170-mile pipeline gains steam nationally. A day earlier, the U.S. Army Corps announced it would not permit Energy Transfer Partners to run the pipeline under a reservoir near the Standing Rock Indian Reservation until it had concluded discussions with the Sioux tribe about possible adverse impacts. The tribe and environmental groups, say the pipeline — designed to carry oil from North Dakota to Illinois — would harm its water supply and disturb sacred tribal burial and cultural grounds. “This action is motivated purely by politics at the expense of a company that has done nothing but play by the rules it was given,” he said. 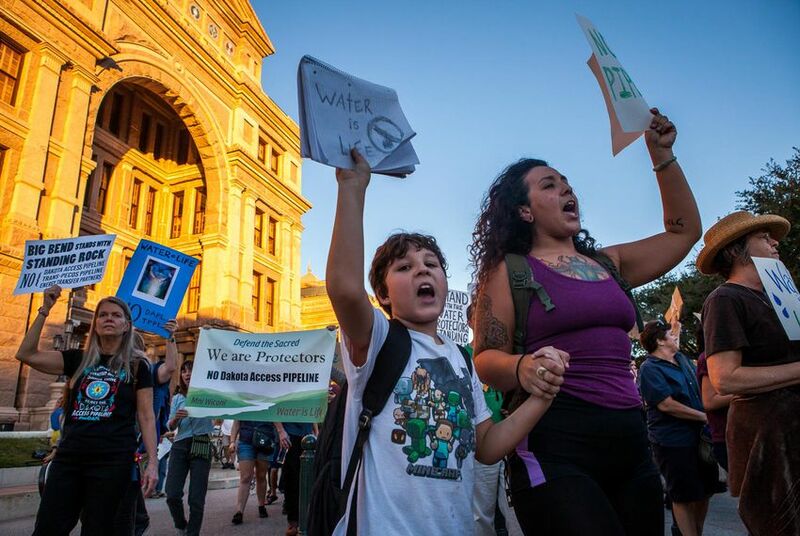 Warren, who serves on the Texas Parks and Wildlife Commission, was the target of protests earlier this month when pipeline opponents descended on a commission meeting to demand that he step down from a post that calls for protecting the environment. The Federal Energy Regulatory Commission signed off on a stretch of the Trans-Pecos Pipeline that would cross below the Rio Grande, handing a setback to a coalition of ranchers, environmentalists and landowners that sought to thwart the project. New filings show how just a few heavyweight financial backers are keeping former Gov. Rick Perry and U.S. Sen. Ted Cruz in the money race by contributing millions apiece to the Super PACs backing their presidential candidacies.